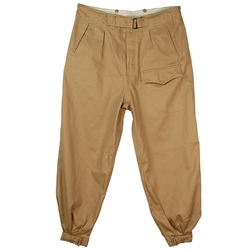 Reproduction of the German Luftwaffe WWII Tropical Trousers. Excellent quality ribbed cotton twill fabric in tan color. U.S. Sizes: 32, 34, 36, 38, 40, 42. Copyright © by-the-sword.com 1995-2019. All Rights Reserved.